The government looks set to revitalise the Kitchen of the World campaign, a scheme to accelerate Thailand's plan to become a major world food exporter, expand food startups and ramp up support to promote Thai restaurants overseas, as it aims to boost food exports to contribute more than 6 percent of the country's GDP. Speaking at ThaiFex: World of Food Asia 2018 on the theme "Thailand Creative Food", Deputy Prime Minister Somkid Jatusripitak said Thai food production needs to focus more on added value and develop all supply chains for traceability to achieve internationally recognised food safety standards. "The government itself has unveiled a policy to promote innovation and technology investment for food industries," Mr Somkid said. "The linkage of digital technology with agriculture, food, and tourism will increase competitiveness and income for the local economy. "The Commerce Ministry needs to work closer with the Thai Chamber of Commerce to revitalise the Kitchen of the World project, while the government pledges to allocate more budget in the next fiscal year to finance comprehensive food development that covers not only food quality but also quality of chefs, e-commerce, technology, innovation and startups to create authentic Thai food and products for consumers. The state-owned Export-Import Bank of Thailand should also play a more active role to facilitate startups opening Thai restaurants worldwide." Initiated 15 years ago, the Kitchen of the World campaign aims not to merely accelerate Thailand's plan to become a major world food exporter, but also spearhead the export of products from the One Tambon One Product scheme. The most important mission of the Kitchen of the World strategy is to ensure that Thai food products are up to the safety and hygiene standards that are required by international rules. According to Mr Somkid, food demand in the world market grows every year and Thailand ranks 15th among food exporters, making up 2.3 percent of the total world food market. Thailand's food exports amounted to about 1 trillion baht last year. More than 70 percent of the food industry was slated for domestic consumption and 30 percent for export. The top 10 export products are rice, processed chicken, canned and processed seafood, frozen and processed shrimp, and food seasonings. 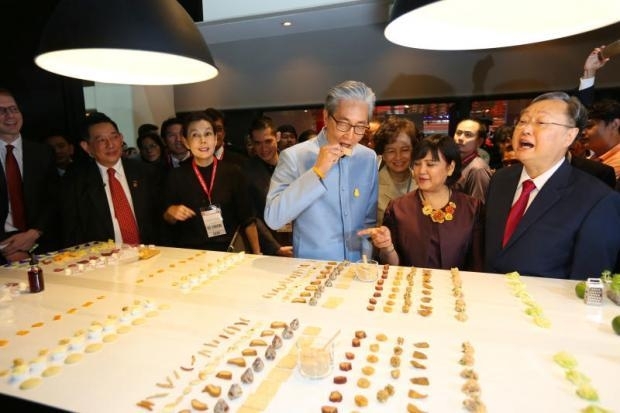 Chantira Jimreivat, director-general of the International Trade Promotion Department, said Thailand this year is focusing on food innovation and food creativity to showcase the country as one of the world's creative kitchens, as dictated by government policy. "Thailand is the largest food exporter in Southeast Asia, with the country's food exports forecast to reach US$29.4 billion (943 billion baht) this year, up 6 percent from the year before," she said. "We are always striving to boost the potential of Thai players so that they become competent and competitive and help them sustainably and efficiently operate in global markets, and ThaiFex is the optimal platform for this. "Playing host to more than 2,500 exhibitors from 40 countries and regions, ThaiFex runs through Saturday at Impact Muang Thong Thani.